Eurocom Corporation (www.eurocom.com), a developer of long lifespan, fully upgradable notebooks, Mobile Workstations and Mobile Servers is offering a full line of Ivy Bridge based notebooks with support for professional graphics from NVIDIA Quadro 5010M, 4000M and 3000M. Eurocom offers a complete line of NVIDIA Quadro powered Mobile Workstations from 15.6” to 17.3” that are specifically designed for professionals of all kinds. Eurocom Mobile Workstations are built to offer unmatched performance, long lifespan and full upgradeability of the processor, memory, storage, operating system and GPU technology, and are designed with the most innovative technology and components available. 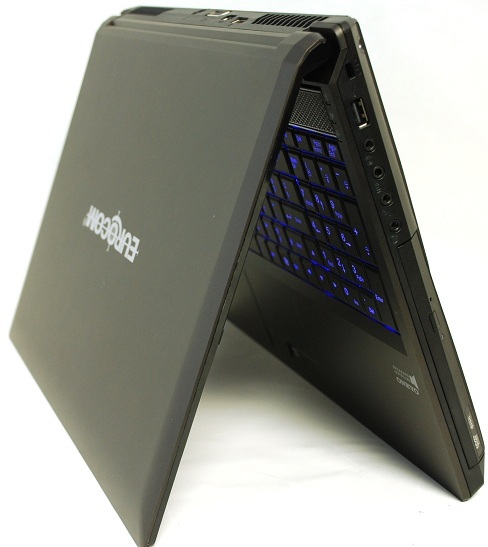 In the line of Eurocom Mobile Workstations with 3rd generation Intel Core i7 processors, Eurocom offers customer choices between displays from 15.6” to 17.3” matte or glossy and graphics options from NVIDIA Quadro 5010M, 4000M to 3000M with up 4GB of DDR5 ECC (Error-correcting code) video memory . Eurocom offers the newest Intel processors from Intel i7-3920XM, i7-3820QM, i7- 3720QM to the i7-3610QM with up to 4 cores, 8 threads and 8 MB L3 cache. In terms of storage, Eurocom offers customers choices of Hard Drives, Solid State, Hybrid and mSATA drives; support for up to 3.08 TB of RAIDable storage offers customers the perfect mix between performance and redundancy. Large amounts of high quality, performance memory is a key aspect of a professional Mobile Workstation, Eurocom offers up to 32 GB of DDR3-1600 RAM via four sockets. With an entirely new 22nm micro architecture, new Intel® Core™ processors pack a number of business-productivity-enhancing features onto the processor die to open up limitless potential. With new features that make working with media faster than ever, new 3rd generation Intel® Core™ processors help multimedia enthusiasts create, enjoy and share videos—how they want and where they want on their Eurocom notebook. Intel 3rd Generation Mobile Core Processors offer increase power efficiency, performance and security. “In certain processor testing suites, Eurocom technicians have noticed upwards of a 14% increase in performance from Sandy Bridge processors to Ivy Bridge processors in the same EUROCOM Racer 2.0 platform. We are very excited about the performance offered by the new 3rd Generation Intel Core processors in our Racer 2.0 and Neptune 2.0 platforms. It is abundantly clear that Intel’s new 22nm and Tri-gate technologies have helped raise the performance ceiling in Eurocom systems” said Mark Bialic, Eurocom President. Large amounts of high quality, performance memory is a key aspect of a professional Mobile Workstation, Eurocom offers up to 32 GB of DDR3-1600 RAM via four sockets in both the Neptune 2.0 and Racer 2.0. With four memory sockets customers can also choose to combine four smaller capacity memory modules for low cost memory configurations. Eurocom currently supports DDR3 1866, 1600 and 1333 RAM. In Eurocom’s line of Mobile Workstations, there are choices between Full HD 1920x1080 15.6” and 17.3” displays. Eurocom offers customers choices between Matte and Glossy displays. This line of products also support Quad Buffering 3D support on external monitors for professional grade 3D support while on the go. Eurocom gives customers the option of professional display calibration to ensure the colour representation on your system is as accurate as possible. In the EUROCOM Neptune 2.0, up to 3 storage drives are offered as well as an mSATA drive. In the EUROCOM Racer 2.0, two storages drives are offered, and an mSATA drive as well. With these storage configurations, Intel Smart Response Technology is supported, it is designed to give users enhanced system performance and responsiveness. Smart Response Technology is an intelligent caching setup that monitors data reads and writes to your storage drive and caches the most used or frequently accessed data. One of the main advantages of the mSATA drive is that it can b utilized to house the computers operating system and frequently used applications to ensure fast responsiveness and system performance. The Neptune 2.0 and Racer 2.0 support RAID 0/1/5 for increased storage performance or redundancy. Eurocom integrates NVIDIA Quadro professional graphics into their professional class notebooks because they adhere to higher quality and reliability standards than consumer level graphics cards. NVIDIA Quadro GPUs are designed and built to provide leading performance, reliability, compatibility and stability with applications like Adobe Creative Suite 5.5, Autodesk 3DS Max, Autodesk Autocad 2011, Autodesk Inventor 2012, Avid Media Composer, Dassault Catia, Dassault Solidworks, Siemens X, ANSYS, MATLAB, Dassault Simulia, ERDAS Stereo Analyst for ArcGIS and Landmark GeoProbe among many others. Eurocom has been testing new Intel Ivy Bridge technology with NVIDIA Quadro 5010M, 4000M, 3000M graphics as well as NVIDIA GeForce GTX 580M graphics with an Intel Core i7-3720XM Ivy Bridge processor. This is done to show customers the added benefits of NVIDIA Quadro graphics technology for professional applications. The results are here. -Memory: Four sockets & DDR3 1866, 1600, 1333 support. 4GB and 8GB modules available. 32GB DDR3-1600 RAM supported.